At first I was going to start my review of All is Bright by remarking that Paul Rudd has the worst Canadian accent I’ve ever heard spoken by a Canadian. Then I realized he was born up the street from me in New Jersey, so that blew that observation out of the water. Now, I’ll just remark, he is a New Jerseyan with one of the worst Canadian accents I’ve ever heard — he overemphasizes syllables to the point of parody one instant and the very next he completely forgets to use it. At least he tries though, I’ll give him that. I’m still trying to figure out what his costar, Paul Giamatti, was using. 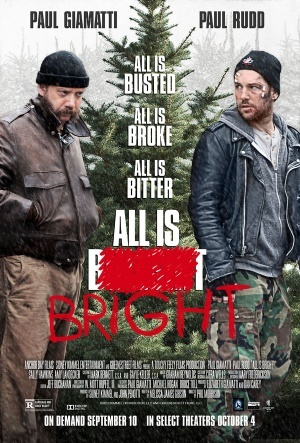 And that basically amounts to all the comedy you’ll find in this drab, almost-a-buddy comedy drama about an ex-con, his ex-accomplice and their attempt to go straight by selling Christmas trees in Brooklyn. 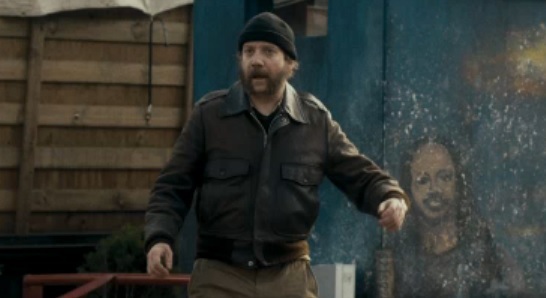 It’s a tenuous relationship as Rene (Rudd, “Wanderlust”) let Dennis (Giamatti, “Rock of Ages”) get pinched during a burglary and is now actively sleeping with Dennis’ estranged wife Therese (Amy Landecker, some TV movies and series) and playing the daddy role to Dennis’ daughter, Michi (Tatyana Richaud), who thinks Dennis died of an unknown — but incredibly painful — disease. But hey, money trumps animosity and it makes for great drama. And now and again All is Bright actually gets around to delivering some too. Rene and Dennis get to talking on more than one occasion while sitting in their dilapidated shack-on-wheels or around a makeshift fire at the corner of Loneliness and Depression Streets — Dennis is adamant about reconciling with his wife and staying on the straight and narrow, Rene is adamant about marrying Dennis’ wife and staying on the straight and narrow. Both agree they’ve been served lemons in life. Director Phil Morrison agrees, choosing to shoot everything about their foray into salesmanship with a grey, depressing lens. (It’s fitting because you wouldn’t want to buy a tree from these scoundrels anyways). A loser to the end. Hell, even when lady luck shines upon them in the form of a Russian nanny to a wealthy family named Olga (Sally Hawkins, “Jane Eyre”), it only livens the atmosphere temporarily. Her whole inclusion, however, is suspect. It’s as if writer, Melissa James Gibson, decided midway through All is Bright that a comic foil was needed and so all of sudden Olga appears in furs and gaudy jewelry, makes off the cuff observations (with a questionable accent as well) and retreats back to her terrible life of splendor. She does bring some minor Christmas cheer to the proceedings, and in doing so she reminds the audience that there is some semblance of good to be recovered in these guys even if the rest of movie says otherwise. But by the time the contrived finale presents itself, not only have these guys returned to their douchebaggery ways under the guise of some hokey familial pretense — and effectively erasing all shreds of goodwill in the process — but they’ve reduced Olga to their level as well. It’s a rotten way to close considering All is Bright is supposed to tell us the light at the end of the tunnel is hope, not an inbound train that crushes all who happen upon its light.